WSU’s long history of excellence in materials research has had and continues to have broad impacts on state and regional industries. Our researchers are developing materials to address, particularly, the generation and efficient use of power and energy. Research areas include composite materials for airplane manufacturing, new battery technologies, sustainable building materials, and crystal growth that is important for high tech solar and semi-conductors manufacturers. Industry in the Northwest is heavily reliant on the materials research that comes out of WSU, and our work directly impacts the economy. More than 40 percent of the $1 billion wood-plastic industry in North America uses material formulations developed at WSU. WSU’s Composite Materials & Engineering Center has more than 30 patents on inventions in areas such as nondestructive evaluation of wood materials, wood plastic composites, and composite materials processing. Kelvin Lynn, Boeing chair of advanced materials, George and Diane Conniff distinguished professor, and director of the WSU Center for Materials Research, conducted pioneering research in the design of positron beams and constructed the first prototype. At WSU, he has developed the most intense source of positrons for use in a positron beam in the US, possibly in the world. He is working on the development of a positron trap. A fellow of the American Association of the Advancement of Science (AAAS) as well as the American Physical Society, his work has been extensively cited around the world. 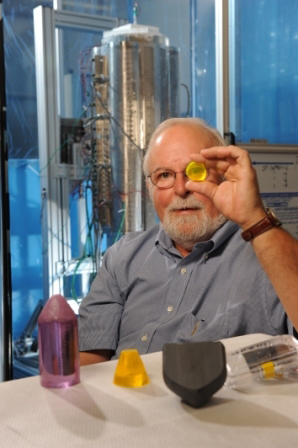 The Center for Materials Research is a leader in the growth and characterization of crystals that are used for civil and military laser applications. The Center for Materials Research (CMR) conducts interdisciplinary research in areas including atomic calculations, ceramic processing and characterization, environmental degradation, time resolved X-Ray analysis and super plasticity. Learn more. The Composite Materials & Engineering Center (CMEC) develops new building materials from a range of recycled and virgin resources. They also develop innovative structural systems to effectively use new materials while maintaining economic viability and public safety. Learn more.